Casa Palmas is an experiment in residential architecture built on a limited budget by the young studio DOSA in Mexico. Near the centre of Texcoco, Casa Palmas was designed by DOSA Studio through a participatory process in close collaboration with the clients. The Casa Palmas project by young Mexican studio DOSA is an experiment in residential architecture built on a limited budget. In a country like Mexico where many people still build their own houses, without any specialised skills or application of even minimal parameters for residential constructions, such as lighting and ventilation requirements, Casa Palmas sets an example, because even though it is of limited size, it attempts to meet the requirements for light, ventilation and privacy. 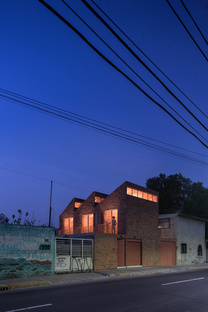 The clients’ family home had stood on a small lot in the Las Palmas district of Texcoco for at least 40 years. The family brings several generations together under the same roof, and decided to ask a small architectural studio to improve their living conditions while continuing to live all together. 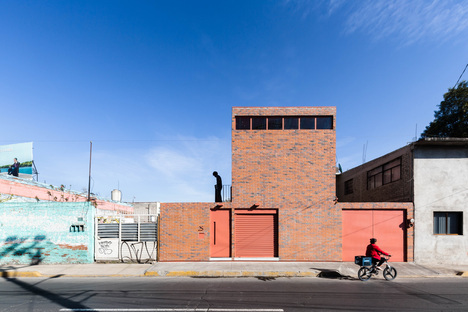 Like many buildings in Texcoco, the existing house had been enlarged and transformed over the years, adding volumes as required to meet contingent needs without any overall planning. The first decision was to demolish the home and build a new one that would clearly appear to be a single architectural unit. The location of the lot, on a street near the city’s main road, with obvious problems of traffic congestion and noise pollution, favoured the idea of unity as an expression of shelter from the outside world. 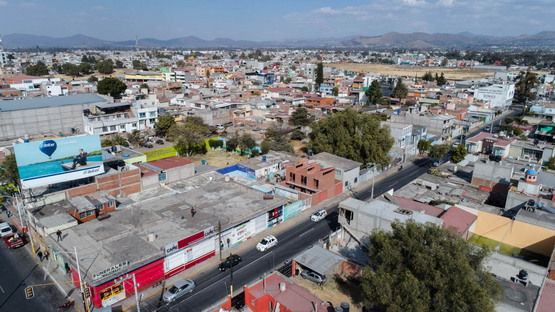 One of the things that make this Mexican city so fascinating is the multicoloured urban horizon in which mural paintings alternate with shop signs and big fields of solid colour. The rows of volumes built on the same scale, alternating shops, workshops and homes all in the same neighbourhood, produces a discontinuity that often affects the home’s recognisability and identity as a private, sheltered place. In Casa Palmas, the recognisability of the home is treated as a key element of well-being, above all for a large family that identifies with the home as building, underlining its confines by using bare brick as the only construction material in the project. Brick is used to define not only all the inside and outside walls but the perimeter of the lot, creating a compact, precise volume. Despite this, the design maintains differentiation by function, underlining the three parts of which it is made, the main covered nucleus and the two side courtyards, one used for utility purposes and another acting as a filter between the home interior and the neighbourhood. The main access is via this latter courtyard, a “stone garden” outside the ground-floor living room and kitchen with two glass doors opening onto it and the three bedrooms sharing a single first-floor balcony above it. This western wall is the main façade, the most open one, bringing light into the living room and bedrooms. The southern and eastern walls, with the second courtyard, providing parking, are more enclosed, sheltering the house from strong sunlight during the day. As the temperature begins to drop toward evening, and the area has a very high temperature excursion, the garden and the most commonly used rooms face west, so they can enjoy the last rays of sunlight. This is the reason for selection of a type of building brick characterised by high thermal inertia, which absorbs and releases heat slowly to allow the rooms to stay cool during the day while receiving heat at night. The shed roof is a very interesting solution, with each shed incorporating a pane of glass to light up one of the bedrooms: the movement of the shadows marks the passage of time while respecting the need for privacy. In a neighbourhood where there is no typical style but various types of construction are combined and transformed, this element adopted from industrial architecture gives the Palmas home an identity of its own, standing out like a waving flag amidst its undistinguished urban surroundings. To avoid the need to compromise between the budget and the need to improve the family’s quality of life, the project leaves the surfaces completely bare, without any finishes, using metal painted dark red in the frames and staircases as the only method for connection and detachment between the bare concrete floors and the walls, the only non-structural detail. There is, on the other hand, a strong focus on the grid of walls, on the quality and colour of the brick, the hues of which form a precise design with their varied hues ranging from black to red and yellow, recalling some of Alvar Aalto’s projects. The bare interiors, containing only simple furniture made of wood and metal, confirm the sobriety of the home’s characteristic style.